Dongguan Silent Industry Co.,Ltd was established in 2006,prior to that year,we're a gear hobbing manufactory which started business from the year of 2000.We've been certified by ISO 9001:2015 and ISO 14001:2015,world class manufacturing facility in Dongguan,China.We're specializing in custom design and manufacturing precision gears,gearboxes and gearmotors which used in a wide range of motion applications such as automobile parts,automatic ticketing systems,water dispensers,,business machines,office equipment,security locking system,robotics,smart home application,automatic vending machine,lawn mower,electric toy,electric shutters & blinds,aeromodelling,medical devices,cameras,personal healthcare,power tools,building automation and industrial automation and so on. We continue to invest in new technologies to provide the latest technology with innovative newproducts and with ongoing investments in state-of-the-art manufacturing equipment such as Affolter AF110 plus,12 axes CNC gear hobbing machine,this will support our ability to offer our extensive standard catalog precision gears and special part manufacturing capabilities. For gears,since most machining equipments are from Hamai in Japan and Affolter in Switzerland,the gear accuracy can be ISO 7 with good consistency. For gearboxes & gearmotors,since most of components are steel turned by CNC lathe,we're able to offer high torque,long life time for the products.The helical gears are also very helpful to reduce noise. We’re striving to to be one of top level quality and high-precision gear manufactories.To be an enduring company by creating superior products for motions. To be a strong brand worldwide with outstanding performance and compelling innovation in high-precision motion applications.Our products will be sought after for their compelling design, superior quality. Customers' satisfaction is NO.1 priority is our core value.The foundation of our culture is honesty, integrity, transparent and respect for associates, customers, and business partners. We are ISO 9001:2015 certificated manufactory.We consider the quality is the most important.We consistently focus our attention on the quality management system and we usually to use FEMA,PPAP and CPK analysis to improve it.The reasonable price and on time delivery are also the key points for all customers.All our staff consider customers' satisfaction as the highest priority. 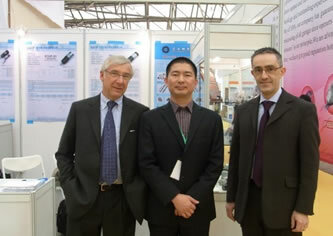 Mr.Zhong,the middle guy in left photo,is the founder and general manager of Silent. "We're professional manufacturer for geared motor for years in China.I think the planetary gearbox and geared motor industry is a large potential market in all around world in future.So we're looking for business partner to work and develop together.Anyone who is interested,we can discuss it with more details.Wish you all the best ! "